Support to help vulnerable, low-income people achieve economic security continues to shrink, increasing the need for cross-sector partnerships to fill in the gaps and for philanthropic dollars to maximize their impact. This lack of capital prevents many in our nation’s cities from having access to necessities like quality child care centers, health clinics, affordable housing, healthy food and social service providers, all of which stabilize, revitalize and grow low-wealth communities. That’s where social investing comes in. Social investing allows us to leverage the foundation’s assets in ways beyond traditional grants and to support markets not well served by the private financial sector. That might mean providing capital to borrowers doing business in economically-stressed communities – where the risks are above average – or to buffer the economic risk of borrowers piloting new financing structures. We began investigating ways to accelerate change by expanding beyond grantmaking in 2007. Since then, we have established ourselves as a multi-faceted capital provider able to offer a range of support including grants, loans, equity and guarantees. In September 2015, the Kresge Board of Trustees approved a $350 million pool of social investment funding that will be deployed by 2020. 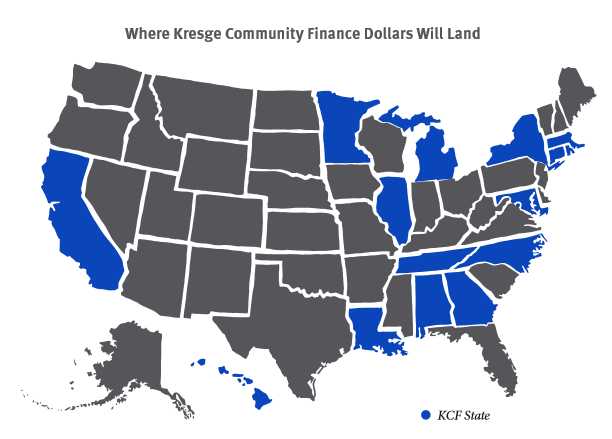 This move reflects an inflection point in the foundation’s identity and way of working, making clear the belief that using a variety of investment tools to bring enhanced opportunities to low-income people in America’s cities is central to Kresge’s DNA. In 2016 our Social Investment Practice made 14 commitments totaling $48.6 million. See Social Investments Made to learn about each commitment. Each month, the Social Investment Practice shares its insights and learnings through our article series, Mission, Money & Markets. Read about what the team is learning through its commitment to invest $350 million in impact investments by 2020. In this short case study, learn how and why the Kresge Social Investment Practice made an investment in the Greater Cincinnati Redevelopment Authority. This 2016 transaction is intended to help the Authority develop micro business districts with neighborhood-serving small businesses in Cincinnati neighborhoods where there is also housing development in place. We use loans, deposits, equity and guarantees to support organizations and efforts that advance our programs’ goals. We seek to attract capital from other sources, including financial institutions, private investors, other foundations, donors and government agencies, and strive to bring together potential partners and serve as project ambassadors. Because our goal is advancing social good, we take more risk than private-sector financers when there is commensurate opportunity for impact. Many of our investments are through intermediary partners such as community development finance institutions (CDFIs). Social investments may take the form of direct loans, guarantees that provide credit support to borrowers, equity investments, or linked deposits. Organizations with prospective projects should acquaint themselves with the Kresge program that most closely aligns with their activity. Our social investing and program teams work together to review proposals. To stay abreast of path-breaking innovations that would lead to better access to capital for low-income communities in cities, our team participates in meetings and conferences of leading social impact organizations including Mission Investors Exchange, Opportunity Finance Network, Global Impact Investors Network, US SIF, and others. We also work with many of the nation’s largest banks, including JP Morgan Chase, Goldman Sachs, PNC and Morgan Stanley, and with other national funders, such as The Ford, Robert Wood Johnson and MacArthur foundations. We actively recruit potential collaborators and explore new funding opportunities through our involvement with these networks and partners. The Social Investment Practice does not typically accept unsolicited proposals. On March 31, 2016, we issued a request-for-proposals called Kresge Community Finance. It was open exclusively to certified Community Development Financial Institutions (CDFIs) and quasi-private or public Development Finance Agencies (DFAs) doing work that aligns with our programs and expands opportunities for low-income people in America's cities. You can download the RFP in our library. Applications are now closed. Read more about the initiative in our article series, "Mission, Money and Markets." You may stay in touch with us by subscribing to email alerts or by following @kresgesocinv on Twitter. You may also email us through the Contact form. Please select Social Investment Practice in the inquiry field. View and download our 2017 Social Investment Practice brochure.